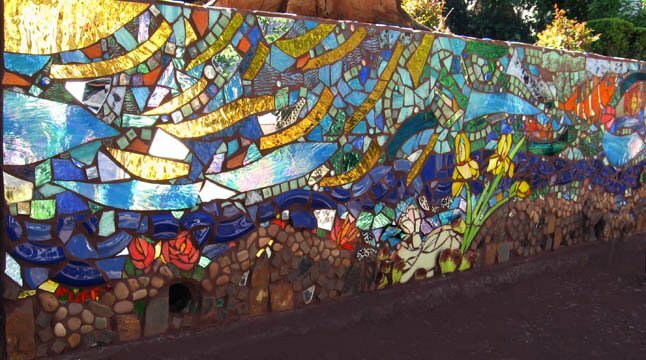 This is a commissioned mosaic created over an unsightly retaining wall. It is 3 feet high by 20 feet wide, created with mirror glass, art glass, and an entire set of blue dishes. There is a stone and slate river bed housing Bunny and Mr. Frog. My original drawing included a snake, which was vetoed by the wonderful owner. I welcome the opportunity to create mosaic art to fill your needs, whether on site like this wall, or created in my studio then transported to your site. My full site has detail pictures as well as a slideshow of the wall being created.